Compositional mapping of asteroid population based on spectral and spectrophotometric data (CMAPS) project aims to derive a compositional mapping of the asteroid population by taking into account the spectral and spectrophotometric data available today. Within our analysis we will incorporate new data from near-infrared surveys such as VISTA. To achieve this objective we will develop a data-mining framework to retrieve data from the existing surveys and telescopes databases, which do not have dedicated pipelines for the asteroids. The use of spectral data with spectrophotometric data, both in visible and NIR region will provide a refined understanding compositional distribution over asteroid populations. The by-product of this accomplishment will be the development of a set of methods to handling and analyze together spectral and spectrophotometric data. Part of our main objective consists in building up statistics, find correlations and trends over a large number of visible and near-infrared spectra of asteroids. It is expected that such statistics will reveal correlations between size, composition and source region of the different categories of asteroids. 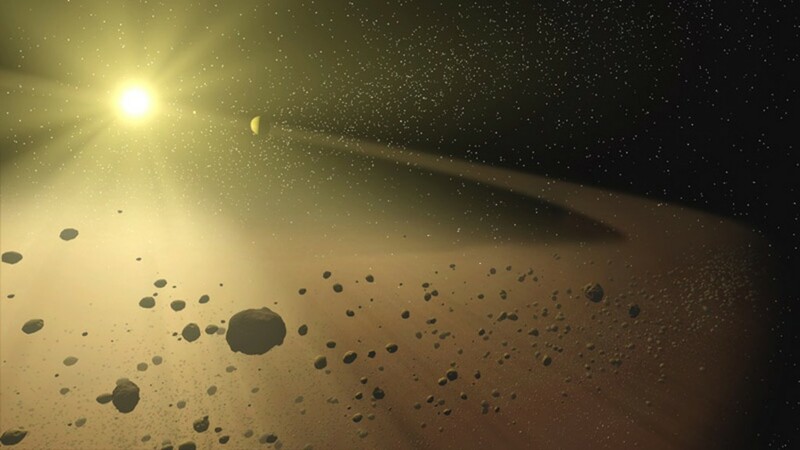 Our project will provide comprehensive answers to questions such as: What are the statistical properties of different populations of asteroids; What is the relationship between asteroids comets and meteorites; What is ratio between primitive asteroids and those with evolved surface? The second aim of our project is to consolidate the recently formed team of planetologists at the Astronomical Institute, Romanian Academy. The use of the already existing collaborative relations with institutes such as IMCCE - France and IAC - Spain will significantly increase the experience of our team and the possibilities to obtain access to survey products (such as VISTA) or telescope time for performing observations according to our subjects of interest. Aiming to model the compositional properties of asteroids using spectral and spectrophotometric data the current proposal has a strong multi-disciplinary character merging expertise from different fields of Astronomy / Astrophysics with Geology / Geophysics, Meteorology / Atmospheric Sciences and Space Science / Plasma Physics. First, is the scientific reason -find answers to the fundamental questions: (1) “how physical and chemical processes determine the main characteristics of the planets”; (2) “how planetary systems originate and evolve”; (3) “how life developed in the Solar System and in what ways life modifies planetary environments”; and (4) “how simple, basic laws of physics and chemistry can lead to the diverse phenomena observed in complex systems”. The scientific reason led to spacecraft exploration of the Solar System. Second, is the practical reason - take measures for avoiding impacts with objects in the vicinity of Earth, and also the possibility to use Solar System objects as resources for the space exploration. The spacecraft missions are the pinnacle of scientific exploration and represent the new advent of the mankind. The total number of asteroids known today (December, 2014) exceeds 600 000 with the vast majority of them being concentrated between the orbits of Mars and Jupiter in the so-called asteroid main-belt(Figure 1). More than 11,000 were found in the terrestrial planets region. These objects are called near-Earth asteroids (NEAs) and they are of a particular interest since their orbits will bring them in the near-Earth space. The significant risk posed to our planet by the objects near the Earth orbit (NEO), both in the mid-term future and in the documented past, prompted immediate measures backed up at political level. NASA has announced NEO’s Survey Program with the goal to detect, track, catalog and characterize by the end of 2020, 90% of NEAs with a diameter greater than 150 m.
The small bodies (asteroids, comets) of the Solar System are the remnants of the planetesimal population that once formed the planets. Even if some of them were affected by thermal and dynamical evolution and by collisions, most of the asteroids did not suffered a significant geological evolution, preserving the physical evidences related to the first 200 million years of the Solar System history. It is considered that these bodies have retained a record of the original composition of our Solar System’s proto-planetary disk. Moreover, they retain material that pre-dates the Solar System and contain evidences for interstellar processes and its original formation in late-type stars. Several scenarios for the origin of life on Earth invoke an exogenous delivery of organic matter. Thus, small bodies may have been the principal contributors of the water and organic material essential to create life on Earth. 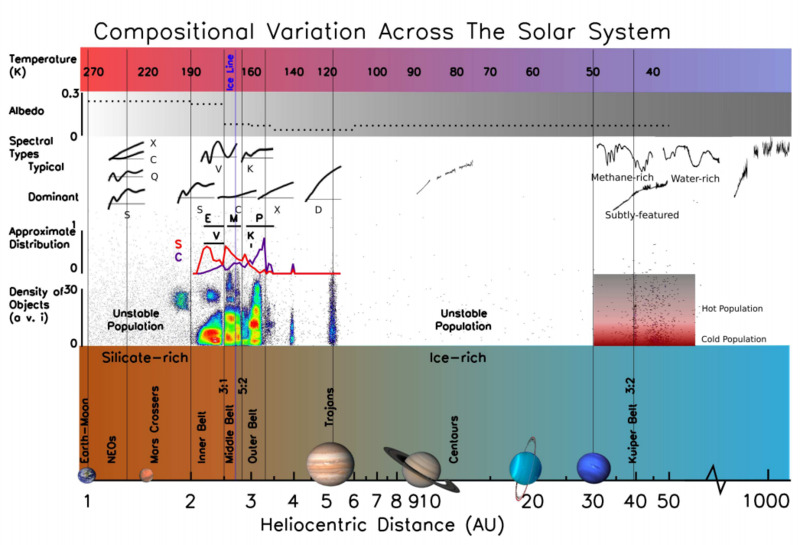 Figure 1 : Synthetic Solar System overview on which minor planets are represented together with their spectral properties (Source: DeMeo, PhD thesis Paris Observatory, 2010). Even many other planetary systems are discovered today, there is far less data on these planetary systems and no data related to their minor bodies. On the other hand, the detection statistics are highly biased by the observing techniques and the data available is relatively new and have not been used to constrain many planetary formation models. The discoveries of exoplanets up to now have shown that the nature is more creative than theorists. In this context the studies of our own Solar System could provide answers to the fundamental question of how life and such complex structures have evolved from a cloud of gas and dust. The robotic missions to the surfaces of the planets, moons, asteroids, and comets are the pinnacle of the exploration of the Solar System. For the greatest possible returns of a space mission, the knowledge of the ensemble of physical parameters of objects and their composition is a critical point in defining the mission objectives . Thus, Today the planning of space exploration is based on strong ground-based science. Another important goal for studying the Solar System small objects is to determine their potential as resources for the space exploration. In particularly, asteroids and comets, with perihelia near the Earth could be sources of economic materials, including metals, water, and rocket propellant (e.g., C-rich compounds). Even at its infancy, this domain is a branch to be studied in the future, with many opened possibilities. For all the reason shown above the physical characterization of the asteroids is particularly required with impact on fundamental since and with significant practical reasons. “Planetary Science is now a major interdisciplinary field, combining aspects of Astronomy/Astrophysics with Geology/Geophysics, Meteorology/Atmospheric Sciences and Space Science/Plasma Physics”. This branch of astronomy is not just an important component in the education of an astronomer, but offers the opportunity for the Earth sciences to have a comparison for their theories and models. The topic of the asteroids and comets was recently brought to foreground by the last findings of the Rosetta missions, such as the Earth primordial water source. In the last decades, telescope investigations have been conducted with spectacular spatial and spectral resolutions, permitting detailed examinations of asteroids. These results have revealed an unanticipated underlying structure that points to the dramatic history of the Solar System. A wide diversity of asteroid compositions which considerably varies with orbital parameters has been discovered (Figure 1). Even though the number of discovered asteroids increased exponentially in the last years, mainly due to some dedicated surveys, far less have any kind of physical data. DeMeo & Carry note that even though we have some basic asteroids distributions, “we are still literally only scratching the surface of what can be known about them”. This affirmation is supported by the following facts: WISE provided albedo measurements for about ~150,000 asteroids; SDSS provided colours in visible regions for about ~80,000 asteroids, about ~6,000 asteroids have some lightcurve information and about 3,000 asteroids have any/some kind of spectral data. Photometric measurements in multiple bands are used to determine the color of an object. Photometry in multiple bands could give the first clues regarding the body composition being well suited for very faint objects. A comprehensive investigation can be done using spectroscopic measurements. Indeed, spectroscopy proved to be one of the most powerful scientific tools for studying the nature. The study of celestial bodies using spectroscopy connects astronomy with fundamental physics at atomic and molecular levels. In the past two decades, developments of CCD spectrographs have made it possible to obtain data of significantly fainter asteroids. The most important spectral and spectrophotometric surveys have made their data available on-line. However, the exploitation of these data in terms of the construction of mineralogical models, comparison to laboratory spectra, and taxonomy is treated individually by each team working in this field. While the spectral databases for planetary surfaces increase in size and the methods for modelling the spectra are now well-defined and robust, there are no standard set of routines for handling all these data. DeMeo & Carry into their recent review have describing Solar System evolution are derived from the visible colours and albedo measurements. They reveal a great mixing of bodies supporting the idea of a Solar System that was and continues to be in a state of evolution. However, based on the visible colours and albedos only broad groups of asteroids can be defined. These classes define a wide variety of surface composition. They concluded that the compositional trends discussed up to now cover broad taxonomic classes and combine objects into just a few major groups that do not accurately reflect the complexity of the asteroids original and current distribution. For most of the asteroids, detailed near-infrared information can be obtained using medium and large telescopes (3-12 meters of diameter). Differential tracking and the sensitivity of the detectors impose additional constraints for obtaining asteroids spectral data. The astronomy in our days relays on the major surveys results. For example, the data from SDSS and WISE has brought a basic compositional mapping of the asteroid belt. Several major surveys (i.e. GAIA, VISTA, J-PAS, EUCLID) that will provide data in the near-infrared region are under development. Retrieving asteroid information from these surveys is mandatory for improving the knowledge about asteroids. However, on most of these surveys there are now dedicated pipelines for Solar System objects. This is due to the fact that Solar System objects moves, thus their position depends strongly on the observation moment and the orbit precision. Our project builds upon previous important results of team’s members and on demonstrated observational and analytical experience in the study of Solar System objects. CMAPS continues some important results of the P. I. (Marcel Popescu) and of the post-doctoral member (D.A. Nedelcu). In order to accomplish the objectives shown in the Home page of the project we divided our project in 6 working packages (WP). All the participants will be involved in the externals collaborations and results dissemination. WP1. 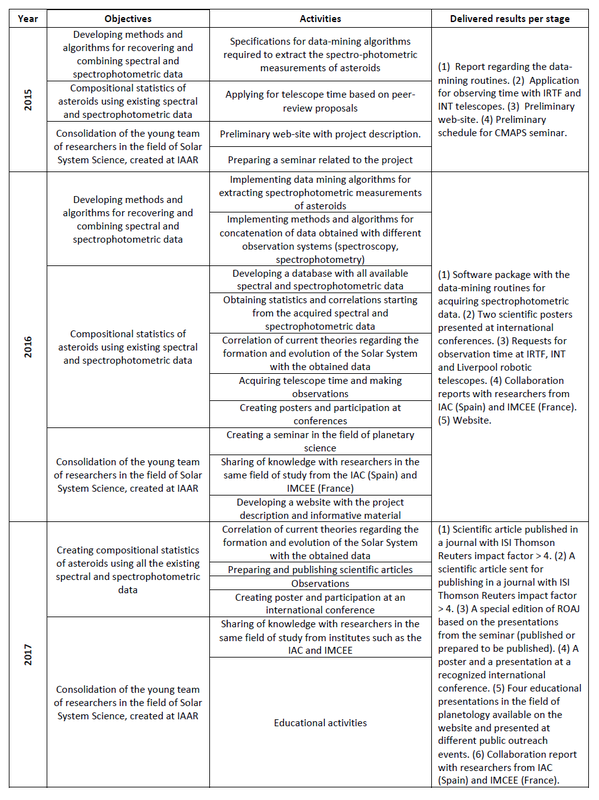 Project management: The following coordinating activities are required: organization of monthly project meetings, weekly managing of the research and dissemination activities, project representation at academic meetings. An important attention will be devoted to academic collaboration. In order to present and discuss recent advancements in the field and to present our results we will schedule short research stages in institutions such as IMCCE and IAC. WP2. Data mining of large volume of astronomical data for obtaining spectral and spectrophotometric characterization of asteroids. WP2 is divided into: 2.1) data mining algorithms to retrieve asteroids spectrophotometric measurements and 2.2) methods and algorithms to merge data acquired with different setups (spectroscopy, spectrophotometry). We will use the Virtual Observatory services (such as Skyboot and Miriade) and tools (such as Topcat). The efficiency of algorithms will be used to retrieve the NIR colors of asteroids from infrared surveys such as VISTA. The second point will be an extension of spectral merging algorithms developed in Popescu et al. 2014(A&A) and Popescu et al. 2012(A&A) to incorporate spectrophotometric data. WP3. Statistics, correlation and trends over a large number of spectrophotometric data. This WP is divided into: 3.1) Create a single database with all available spectral and spectra-photometric data; 3.2) Derive compositional mapping of the asteroid population based on the obtained dataset. Two methods will be involved: taxonomic classification and comparative planetology; 3.3) Review the Solar System evolution models based on compositional distribution obtained from the asteroid population; 3.4 Prepare a scientific article to present the results to the community. WP4. Investigation of peculiar objects using new telescope observations. This WP is divided into: 4.1) Obtain telescope time to study new objects and proceed with the observations; 4.2) Obtain and analyse spectral and spectra-photometric data; 4.3) Prepare a scientific article to present the results to the community. The activities and the expected results are shown in the following table. Popescu M., Birlan M., Nedelcu D.A., Vaubaillon J., Cristescu C.P. – Spectral properties of the largest asteroids associated to Taurid Complex, Astronomy & Astrophysics, 2014.